KUALA LUMPUR, March 11, 2019 – Naza College of Technology and Business, a wholly subsidisary of the Naza Group is offering up to 30% discounts on tuition fee during their Open Day which is happening every weekend from now until 7th April. Students aspiring to pursue a diploma in courses related to the automotive industry and register during the Open Day are entitled to 10% early bird discounts. Additionally, Naza College is also offering Naza CEO Award scholarships for students who excel in sports or art with a 30% waiver off tuition fee* and a 20% tuition fee waiver for students of low income households (total monthly income of whose parents or guardians do not exceed RM4,000)* via the Naza Privileged Scholarship. Students who achieve outstanding results in the Sijil Pelajaran Malaysia (SPM), Sijil Vokasional Malaysia (SVM) or United Examination Certificate (UEC) examintions can also apply for the Naza Merit Scholarship. Other scholarships being offered include the progression scholarship and Naza Family Edu-Aid which provides up to 50% tuition fee waiver for students whose parent(s) are employees of the Naza Group. “Naza College of Technology and Business is dedicated to providing the best of automotive training to students with aspirations to kickstart their career in the automotive industry. It is our mission to ensure their readiness and confidence when they begin their careers” said Dr. Jagdeep Jassel, CEO, Naza College of Technololgy and Business. “We believe that students from all backgrounds are entitled to quality education, as long as they have the drive, passion and qualifications to pursue their dreams. With these financial aid schemes available, we provide a platform for students to pursue their education and aspirations irrespective of their financial background,” he added. Students interested in building a career in the automotive industry are encouraged to visit the Naza College of Technology and Business campus in Glenmarie, Shah Alam for the Open Day to gain insights on the lucrative automotive industry and have one-on-one consultations with skilled and experienced academic staff, and to find out more on the scholarships being offered. 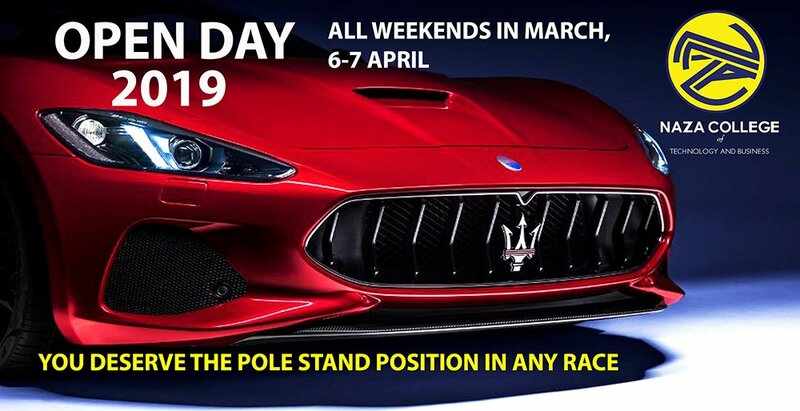 Students who drop by during the Open Day period can look forward to exciting activities instored and even stand a chance to win a pair of tickets to the Asia GT Festival which will take place at Sepang International Circuit from 15th – 17th March! The college will soon be introducing several new courses including Diploma in Information Technology, Diploma in Accounting, Diploma in Business, Certificate in Business Studies, Certificate in Automotive Technology and Sijil Kemahiran Malaysia (SKM) Automotive Technology by this May. Don’t miss out on this great opportunity to kickstart an exciting career in the automotive sector! For more information, log on to http://www.naza.edu.my and follow our Facebook feed at https://www.facebook.com/nazacollegeglenmarie/. It’s Now or Never! Grab Your Chance to win a shopping spree worth RM3,000 at MYDIN! Buy a New Mitsubishi Outlander or ASX and Stand to Win a Holiday!